Boca Raton, FL – May 7, 2012 – Modernizing Medicine announced today the relocation of its corporate headquarters to Boca Raton at the Research Park in Florida Atlantic University. The move to this new state-of-art facility allows Modernizing Medicine to maintain its creative and fun culture, while rapidly expanding with the best talent. Additionally, this beautiful location was strategically chosen for its relationship with FAU. Modernizing Medicine will have access to both the FAU Charles E. Schmidt College of Medicine and the FAU College of Engineering and Computer Science, which will offer potential for joint development of interdisciplinary projects. Founded in 2010, Modernizing Medicine is projected to grow from 70 employees to 100 employees by year-end. Modernizing Medicine was recently named South Florida Business Journal’s Business of the Year Awards, and was recognized for the Entrepreneur Awards in 2011. 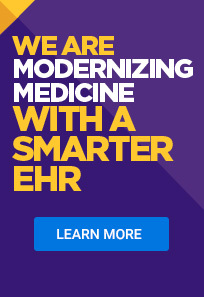 Modernizing Medicine is delivering the next generation of electronic medical records (EMR) technology into surgical medical specialty practices. Our product, Electronic Medical Assistant™ (EMA), is cloud-based and uses no templates or macros; it is available as a native iPad application, or from any web-enabled Mac or PC. EMA adapts to each providers unique style of practice, and easily integrates into their practice ecosystem. Unlike other EMR software, EMA has pre-programmed medical and billing expertise and provides audit protection against claims of insurance fraud. Today, Modernizing Medicine provides specialty-specific offerings for the dermatology, ophthalmology, and optometry markets. Over 1,100 providers at more than 400 practices have already adopted EMA.